Today’s classrooms are filled with learners with varying levels of skills. Some classrooms sizes are larger than we would like, and this can complicate meeting the needs of all learners. How can a teacher in a typical classroom determine what students already know, what they have learned after initial instruction, and where to move in the instructional path? Google Forms can be a teacher’s best friend! Google Forms can be used as a ‘check in’ for readings students are doing in groups or individually. This activity helps in shifting the responsibility of learning to the students to help them realize they play an integral part of their own learning. Google Forms can be used for online quizzes. In my reading class, I use Forms to assess students’ understanding and give them real time feedback by allowing them to see the answers they got correct and the ones they missed immediately after a quiz. Forms also enables teachers to differentiate testing without the students knowing there are different leveled tests. After reading and completing many group activities relating to the short story, I created this quiz for students to demonstrate their learning of literal story elements. I gave a great deal of support and differentiation throughout instruction and all students received the same quiz. I also use Google Forms as a way to have students select books to create unique interest-based book clubs. I prefer to group students based on interest rather than lexiles, as the lexile ranges are already accounted for when I list the book options. Additionally, I employ Google Forms as my entrance and exit tickets to assess where students are in the moment of learning, so I can adapt instruction to meet the needs of all learners. Here is an example of a Prior Knowledge activity before a group of students study about Tsunamis. Assessing ‘prior thinking’ about a story’s main topic could be the base on which students would discover irony, character development, themes, conflicts, traditions, and how free thinking is essential in life. It also allows teachers to craft instruction to individuals, large groups or even small groups. Teachers can engage students in fun activities proving their level of understanding of a topic, as they transfer the concept to the world outside of the classroom. Using a Google Form to extend the topic taught through a multimedia movie representation clip, students can demonstrate mastery and transfer of skills. By using Google Forms and YouTube, teachers can have students demonstrate concept learning in new and different ways, and enjoy the process! Using Google Forms to assess students’ knowledge in real time is such a valuable tool. Once a teacher creates a Form, it’s there to use whenever they want it, or they can revise it whenever they choose. As a homework check-in, Forms can be used to quickly know who did and did not complete an assignment. 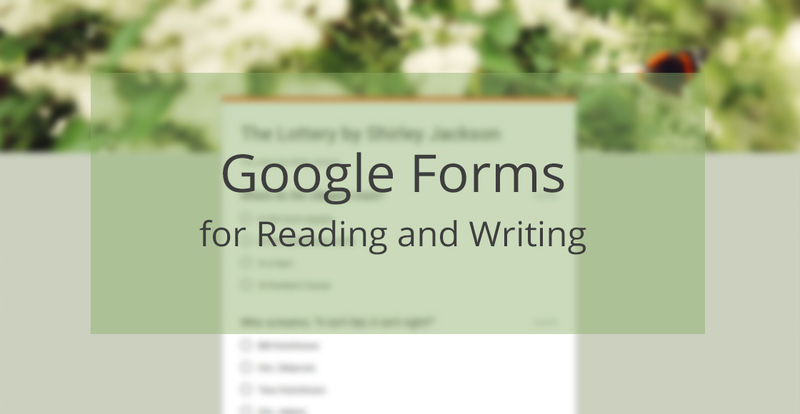 Google Forms fills so many wants and needs in the classroom that teachers. Information on quizzes is given in graphs, in a spreadsheet, and can be viewed by class, or individual student responses. Explore Google Forms and you will embrace the many applications this tool provides. Stephanie Karabaic is a Reading and Writing Specialist teacher in Lebanon Middle School in Lebanon, NH. She is a veteran teacher who has embraced technology and Google specifically, to meet the needs of her students. She is also a NH certified: K-8, Special Educator and Educational Technology Integrator and NJ certified Teacher of English K-12.